*This post may contain affiliate links, please read our disclosure policy. 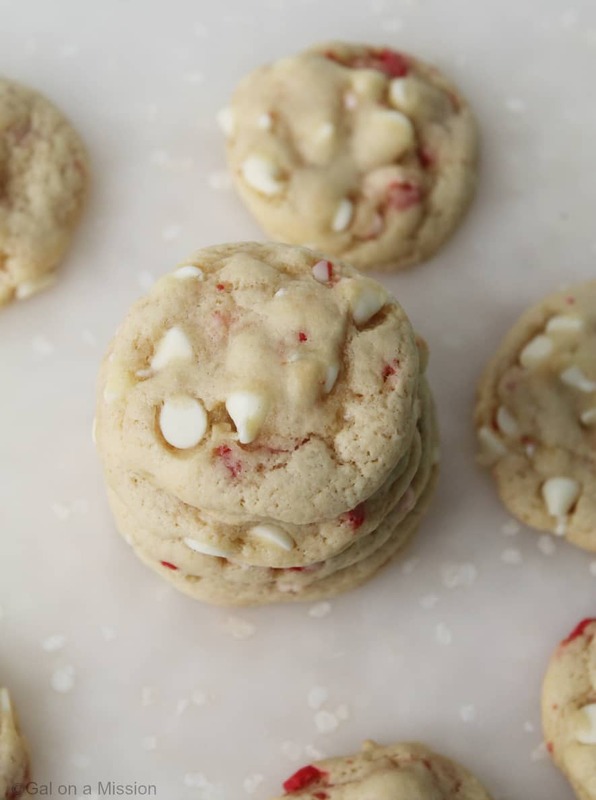 I have been on a mission for one of the best peppermint white chocolate chip cookies and these by far are the winner. Super-soft cookies with a nice crunch to the edge. Just wonderful. 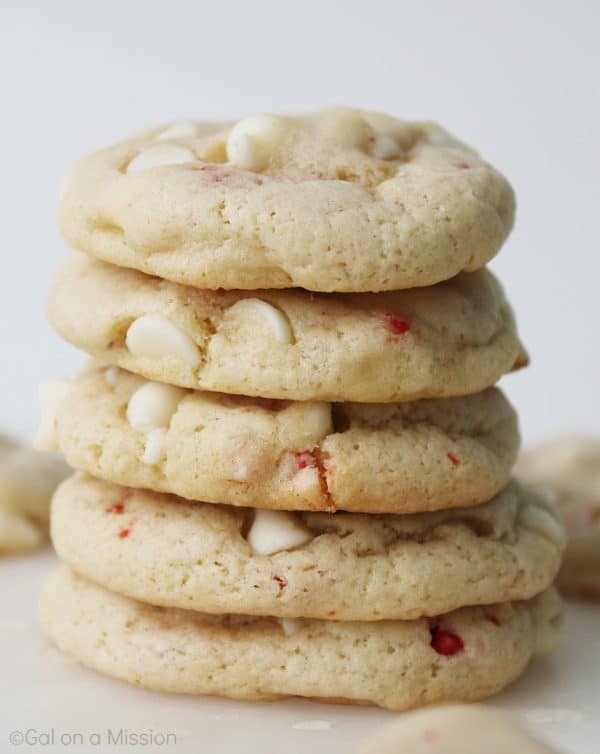 These cookies are absolutely delicious, moist, tons of chocolate, and just enough peppermint. You will not want just one, probably the whole batch. My tip to you, please do not eat the entire batch – I know you really want to, though. Right? 🙂 I do! They are super easy to make, but they do require a simple and a must needed step. You must, I say must because it is a must, refrigerate the cookie dough. You want thick and delicious cookies, not pancake batter ones. All you do is soften the butter, cream the sugar, add in the egg, stir together the dry ingredients, add chocolate chips and Andes Peppermint Crunch. Simple, right? I told you so! These are the types of cookies you will want to put in a cute cookie tin and hand out during the holidays. That is definitely what I am with these cookies, because they are just that good. My family always loves homemade goodies. They are always the best, well baking is the best as well, too. Just sayin’! Using a medium-sized bowl, combine the flour, cornstarch, baking soda, and sea salt together. Set aside. Using either an electric or a handheld mixer, cream together the butter and sugar. While still mixing on low add in the egg and vanilla extract. Slowly add the dry ingredients into the wet ingredients. Mix together. Cover the bowl of cookie dough with plastic wrap and place in the refrigerator for 30-35 minutes. Right before you remove the cookie dough from the refrigerator, preheat the oven to 350 degrees. Line a baking sheet with parchment paper. Using your hands or an ice cream scooper, place the cookie dough on the baking sheet. Tip: I like to make my cookie dough balls a little bit higher so they will be thicker. Bake for 9-10 minutes. Remove from the oven and let cool for 2 minutes on the baking sheet. Transfer to a cooling and rack. Will store in the refrigerator up to one week if they last that long. These look delicious! I love how you used all simple ingredients that are easy to get. 🙂 Drooling! Hi Chelsea, these look delicious. I so wish I had them for our holiday frozen cookie dough swap last week, they would’ve been the perfect holiday addition. Thanks for sharing. This is one of Grumpy’s favorite kind of cookies! Look delicious 🙂 Pinning/Tweeting from DBB! Chelsea, not only do these sound delicious, but they are so pretty too! pinning! Your picture is perfect. i like it and the cookie make me drool. Thanks for sharing and pin. These look so great. Hand them out in a cookie tin? Nope. I will keep them all! 😉 Great tip about refrigerating the cookie dough. These look AMAZING!!!!! 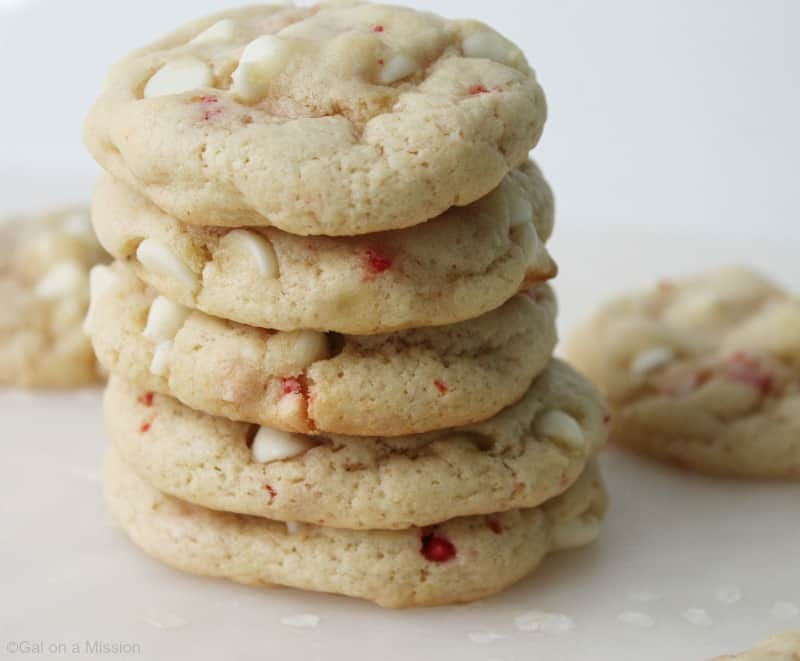 I like to make peppermint bark during the holidays–but I think I might make these instead! Thanks for sharing these today on the Daily Blog Boost! I’m pinning and printing to make (maybe this weekend)! These look so delicious! I’m totally pinning them and sharing them in my Sunday round up! If I can’t find peppermint crunch what can I use? Crushed candy canes or chopped up peppermint kisses? Thanks. I made these cookies for my cookie exchange. We couldn’t get enough of them! They are absolutely delish!! I couldn’t find the peppermint crunch so I used crushed candy canes instead. Thank you!! HI there, the dough seems a bit dry, will it be ok? I followed the recipe exactly but it is really dry and crumbly. Is that how it is supposed to be? Hmmm, I used a stand mixer that could be it – more power. Will definitely add a note in the recipe. I would try and add in more butter a little bit at a time and see what happens. mine was very dry also.. I just added a little water and about teaspoon of butter at a time, they turned out great.